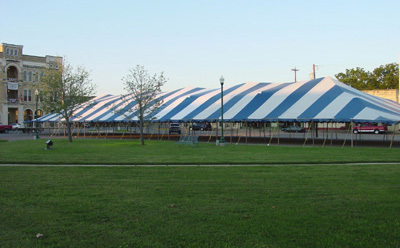 This exceptionally large and spacious party tent is ideal for those big outdoor events. Measuring an outstanding 300 feet wide and 60 feet long, you will be able to accommodate virtually any large gathering of people. Featuring 2 inch seatbelt webbing on the entire perimeter and extremely durable tent poles, this party tent can endure up to 75 mph winds. You can order this tent in solid white, or white with red, blue, yellow, or green vertical stripes.